William Ivey (1919-1992) has had a vigorous posthumous career, if anything it’s been more lively and engaged than his own professional indifference during his lifetime. Ivey was a classmate of Richard Diebenkorn and Frank Lobdell’s at the San Francisco Art Institute and, like them, he studied under Clyfford Still and Mark Rothko. But he never attained the recognition, outside his hometown of Seattle or the Northwest region, that his colleagues achieved. Several museum and gallery surveys since 1992, however, along with this current grouping, repeatedly make the case for his stature. I personally believe he is a greater abstract painter than either Diebenkorn or Lobdell, but it’s unlikely anyone in California will agree. Ivey had one show in San Francisco in 1964, another in Paris in 1974 (nothing sold), and rejected Xavier Fourcade’s offer of a show at his gallery in New York. Why was Ivey so reclusive and resistant to the market? His lifelong friendship with that moral high-horse rider Still is one explanation. Largely unmentioned until now is the Seattle-born artist’s World War II experiences; they could constitute another rationale. Two untitled pastels from 1980 may be read as balls of fire above a burning land: red and orange strokes morph into flame-like masses of smoke plumes. Did Ivey have post-traumatic stress syndrome? Although married, this man was extremely solitary and never attended openings. Perhaps as with his Seattle contemporary, Maria Frank Abrams (a Holocaust survivor), Ivey channeled — or suppressed — such horrors into modernist abstraction in order to control and tame them. Not on view here, the first two decades (1948-68) of his career were characterized by unusually dark paintings. Color and light broke through eventually and came to dominate his big vertical oils with their feathery, fluttering brushstrokes. Two untitled 1983 charcoals re-introduce black smoke and shadows, perhaps studies for the larger, magnificent “Untitled” (1986) with its own ball of fire covered by scumbles of black paint. It echoes “Untitled” (1966) wherein a nighttime sky is pierced by a pale red oval emerging from a pitch-black sky near a block of blue. 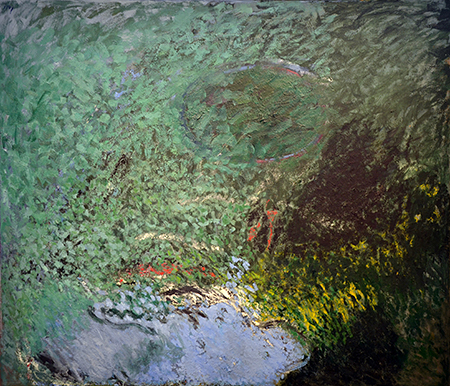 “Green Forest” (1981) has exquisite dappling of a green shower above a pond; in the lower right-hand corner another huge black cloud encroaches. Given these readings, all of Ivey’s art needs to be re-analyzed, and another full-dress survey is needed.